It is not easy getting into vaping. There’s math to learn, electrical engineering concepts to internalize, and terrible device instructions that are impossible to interpret. If you’re not passionate and patient, that vape you dropped 80 bucks on will just end up gathering dust in a corner, reeking of Fruit Loops. 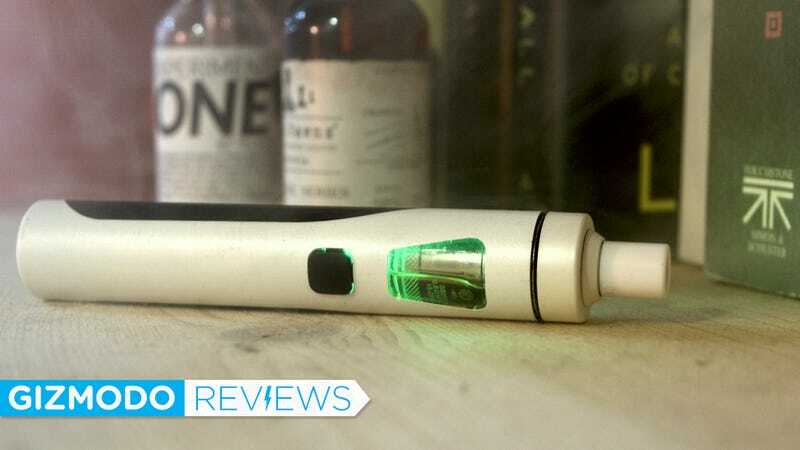 The Joyetech eGo AIO takes all the mind-numbing complexity out of vaping, and at $25, it’s cheap enough for anyone to try at least once. Aside from how easy and cheap it is to use, its best feature is that it’s leakproof. Most vapes, if not filled properly, leak like a sieve. Their instructions are rarely detailed enough to teach you how to fill them without leaving fruity smelling oil all over your hands. And even if you do fill a vape properly, you can’t just toss it in your bag and go on your way—not unless you want a greasy surprise next time to reach for it. The eGo AIO uses a childproof-lock-like mechanism to seal up the chamber where the oil is contained. The top won’t just pop off in your bag, and thanks to the structure of the chamber, oil won’t leak out through the mouthpiece either. To accomplish its leakproof feat, the eGo AIO uses a special coil in the chamber (Cubis SS316). Usually a coil screws into the bottom of the tank. Oil passes through the coil from the bottom, gets superheated and turns into vapor, which is then sucked up though the mouthpiece. It works, but if you ever look down through the mouthpiece you can see the oil, just sitting there and waiting for you to toss the vape in a bag so it can spill all over your belongings. The coil used in the eGo AIO is part of a new “leakproof” series from Joyetech. It’s essentially a closed loop, creating a barrier between the open air and the vat of flavored goo. It’s a neat concept, and I appreciate not finding a nasty surprise in my purse, when I forget my vape in there. As a downside, the coils aren’t as likely to be found in a local store like traditional coils. You’ll almost always have to purchase them online. And if you’re a “cloud chaser” out to produce clouds of vapor so big they consume entire subway cars, the eGo AIO is a lousy vape. It doesn’t let you control the temperature. Most ego-style vapes—the ones that look like an oboe—don’t let you control the temp. If you want that kind of fine tuning you’ll have to move up to a mod (giant boxy vapes). The eGo AIO does allow for adjusting airflow. There’s a ring around the top of the tank for that, but I found it didn’t do much. Clouds were consistently the same size, and the vape tasted the same. The eGo AIO’s only real nod to customization comes in the form of lights that brighten whenever you fire up the vape. You can choose from white, red, fuscia, yellow, green, turquoise, and blue. Sadly, the light comes up through the oil, so my turquoise selection always ends up looking green. I just vape to consume nicotine and try weird flavors. I don’t need a super customizable vaping setup. Just a good, reliable one that gives me a decent cloud and lasts a while on a charge. Corner stores and gas stations sell vaping starter kits for around the same price as the eGo AIO—but trust me, it’s worth waiting a few days for this bad boy to come in the mail instead. No ability to adjust temperature. Great if you don’t care. Terrible if you do.